iOS 11.0.2 update has been released, just a week after iOS 11.0.1 was rolled out. 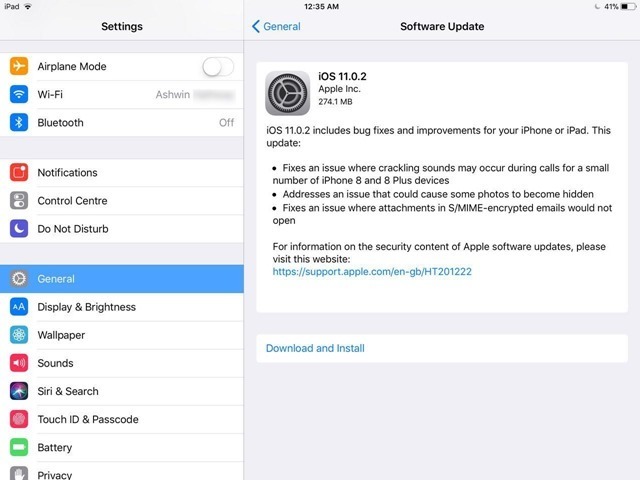 The new firmware fixes some bugs reported by users. According to the change log on Apple's website, the iOS 11.0.2 update fixes crackling sound issues during calls on iPhone 8 and iPhone 8 Plus Phones. It also fixes an issue, which caused some photos to become hidden, and another fix for email related issues. S/MIME encrypted emails which have attachments should now open fine. Many iOS fans have been criticizing Apple for iOS 11 which seems to be a bit of a battery drainer. But there are some things you can do to reduce battery usage. First go to the settings app, search for "Background app refresh", and browse the list of your installed apps. Disable the background app refresh for all games, ebooks, video streaming, music streaming apps. Basically disable it for all apps except email (Mail, Outlook, Gmail) and IMs (like Telegram or Viber), so you don't miss important messages. My iPad 9.7 2017 model, running on iOS 11 gives me 4 days of battery life with 2-3 hours of usage per day. While most of the complaints seems to be from users with older devices, hopefully Apple can address the issue in a more efficient manner in a future update.